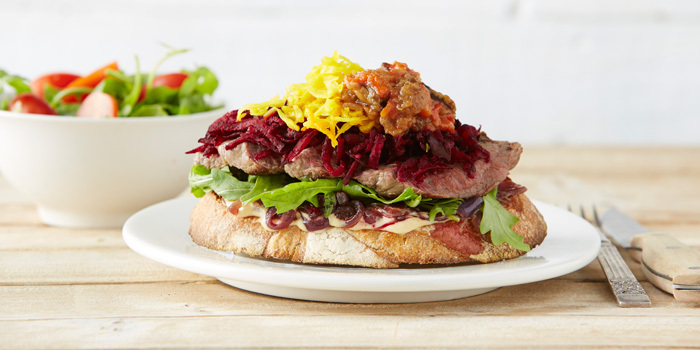 This Naked Steak Sanga is a great way to eat your steak! Packed full of veggies, this one certainly covers everything! 1 tablespoon olive oil, plus 1 teaspoon extra. 1 small (100g) red onion, finely sliced. 1 sprig thyme (or 1 teaspoon dried thyme). 2 x 125g sustainable beef steaks (see note below). 1 medium (200g) beetroot, grated. 1. Heat 1 tablespoon olive oil in a medium saucepan over medium heat. Add onion and thyme. Cover and cook, stirring often for 15 minutes or until soft and lightly golden. Uncover and cook for a further 3 minutes. Remove thyme sprig and set aside. 2. In last 3 minutes of onion cooking, heat a large frying pan over medium-high heat. Rub steaks with extra oil and season with salt and pepper. Cook for 2 minutes each side, or until cooked to your liking. Remove from heat and allow to rest for 2 minutes. Cut into thick slices. 3. Meanwhile, toast 1 slice of bread. Combine mayonnaise and Dijon mustard. Spread toasted bread with half of the mayonnaise mixture. Top with half the caramelised onion, 1/2 cup rocket, 1 steak, half of the beetroot, and half of the Sauerkraut. 4. Pack remaining ingredients away to construct sandwich for lunch tomorrow. We always suggest using sustainable cuts of meat; hanger, oyster blade and flank are all good options. You can cook the steak on a barbeque if you prefer. Gluten-free option: You can use gluten-free bread if you prefer. Paleo option: Give the bread a miss altogether and enjoy ingredients as a meal on its own, or if you like you can roast a large field mushroom and serve it as a bread alternative. This recipe would also taste nice with our Eggplant Chutney. Find the recipe for the Homemade Sauerkraut here. If you didn't make sauerkraut back in Week 2, we suggest you buy a good-quality version from your local health food store.